Photos taken by CVD Hadley and probably in 1947. 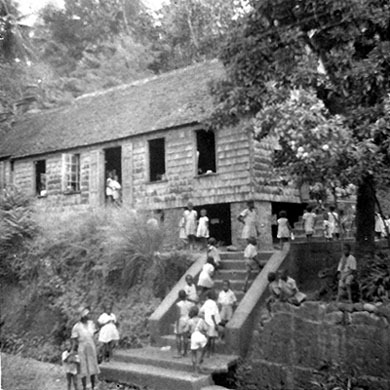 He notes that this is a Biabou Primary School and before placing this picture on the site I received info that maybe a Barbadian, Arnold Drayton was the Principal of this school. I will wait for more confirmation before expanding on this theme. PS: place your cursor over the picture for an interior shot. Wait a minute! do I see a little fellow named Baldwin? I am not really sure and somehow I doubt it. Would it not be remarkable if we had a school roster and we could identify some of those kids going up those steps.